Shanti Volunteer Association (SVA) is a non-governmental organization established in 1981 that provides educational services and emergency relief to underprivileged communities in Asia and the Middle East. Support services in Cambodia, Laos, Myanmar, Afghanistan, and Japan include educational and cultural projects designed to reflect traditional cultures and values. Direct Relief has supported SVA since March 2011 with cash grants to fund earthquake, tsunami, and nuclear disaster relief and recovery efforts. SVA began its relief activities shortly after the earthquake and tsunami struck Japan in March 2011. Kesennuma City was one of the worst hit areas and access to the population of 70,000, many of whom are elderly, was difficult and limited. Funding from Direct Relief has been used by SVA to support a disaster volunteer center in Kesennuma, distribute food and other essential items, and operate a shuttle bus service and a mobile library. Following the disaster relief and reconstruction phase, SVA will concentrate on strengthening local capacity to sustain recovery efforts. Within three days of the earthquake and tsunami that hit Japan in March 2011, Shanti Volunteer Association (SVA) dispatched an assessment team to the devastated area in and around Kesennuma, on the eastern coast of Japan. Using experience from the 1995 Kobe Earthquake, SVA has been able to effectively assess and provide for community needs following the disaster. Disaster Volunteer Center Establishment: In coordination with government agencies, SVA opened a volunteer center in Kesennuma City on March 28, 2011. This center serves as a platform to connect volunteers from all over Japan with the needs of victims. Meal Provision: From April to August 2011, a total of 7,068 meals were served at 16 evacuation shelters and community centers. Goods Distribution: SVA has distributed a variety of goods, including blankets, clothes, food, books, stationary, and protective masks. SVA continually assesses the needs of women, children, and the elderly. They focus on only delivering what is needed to avoid burdening a community with unneeded items. Shuttle Bus Service: When lifelines, such as electricity, water, gas, and transportation, were cut off in the affected area after the disaster, it became difficult to maintain sanitary conditions. SVA provided transportation to bathhouses outside the devastated area to 926 people from Motoyoshi and Karakuwa Districts through May 2011. Community Support: SVA holds events to promote socialization and communication among community members in affected areas, especially children and the elderly. SVA also continues to to assess and support mental health needs. Six events were held in Kesennuma from June through August 2011, including a music concert, a kite-making workshop, a Buddhist sermon, and a trauma support group. Education Support: Parents and children at Oya Elementary School had the opportunity to participate in a 4 week summer program to educate children and provide recreational activities over winter vacation. In addition to providing a productive environment for the children, the program eased the burden on parents during the school break. Cooperation with Local Network: SVA’s work includes multiple joint efforts with other local groups and NGOs such as Nippon Foundation, Mogami Sightseen Association, Tsurumi University, Japan Adventure Playground Association, Kesennuma Disaster Volunteer Center, Japan Library Association, and local boards of education. 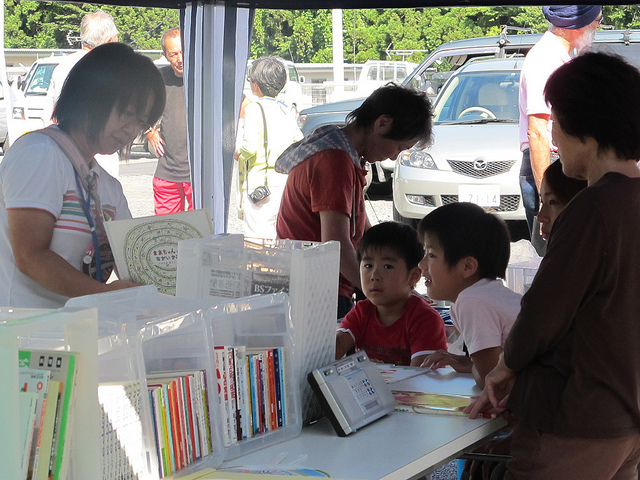 SVA’s mobile library program has become increasingly popular in the temporary housing establishments in Iwate Prefecture. The typhoon season and upcoming winter in Japan would make the current outdoors mobile library setup unusuable. The affects of the tsunami on the local library services, including destroyed books, damaged buildings, and injured or deceased library workers, speaks to the continued value of this service to the community, especially the very young and old. Direct Relief is funding the remodeling of a vehicle, generously donated by Nissan, so that the mobile library can continue services during the winter. Accompanying Activities: SVA hosts activities to complement the book lending service, such as storytelling, movie screenings, Rakugo, and tea pourings. Evaluation: Review and assessment of everyday activities are made and reported on monthly in order to continuously improve the services for the victims of tsunami.